The 8-15mm L-series is an extreme wide-angle zoom lens. I would consider it an effects lens, i.e. a lens that you would use to get a particular effect, in this case extreme wide-angle distortion. It’s not a lens to use if you want to reproduce reality. On a full frame stills chip (eg: Canon 5D, Sony A7s) it creates a completely circular image at 8mm. On an s35mm chip (eg: Sony F5, Canon C300) its gives a very bendy fisheye look. At 15mm its a pretty wide angle with a bend. It’s worth bearing in mind that you won’t get the full width of this lens (ie: achieve a fully circular image) on a super 35mm size chip without using a speed booster. However for this particular effect this is a high-quality, sharp and clear lens. You could think of it like a go-pro feel with much higher quality. I like to use this kind of lens for a rodent or fly eye view for example but you’ll often see them used in music videos and commercials for an extreme look. Also perfect for the point of view of a spy / peep hole in a door. 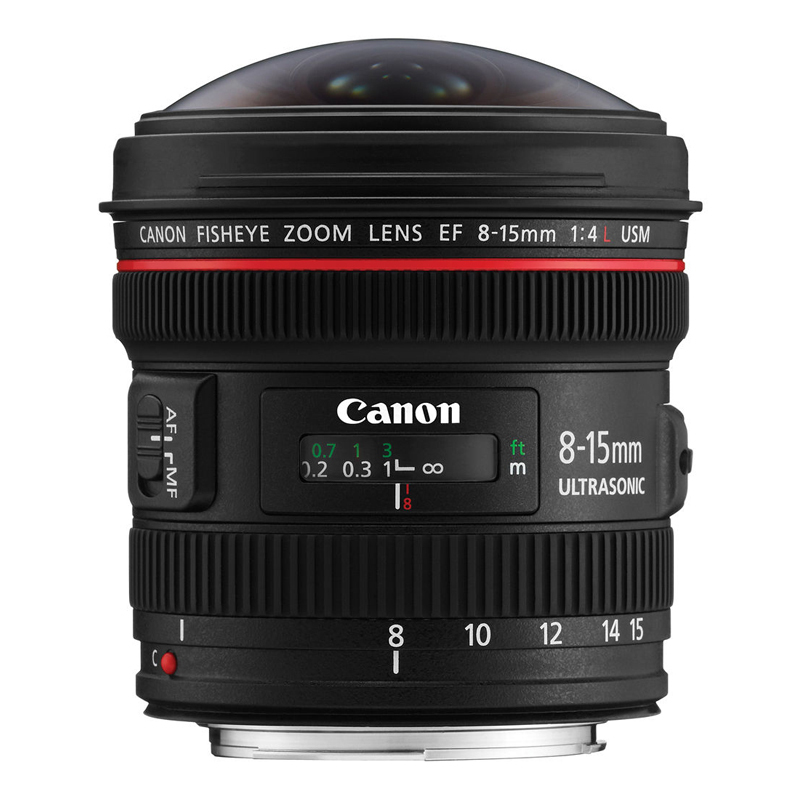 There’s no need to buy two specialist lenses when the EF 8-15mm f/4L Fisheye USM offers, either full frame or circular fisheye images when used with cameras with a 24x36mm (full frame) sensor. For photographers shooting with DSLR’s with a smaller sensor, full frame fisheye images are possible. With a 180 diagonal field of view, capturing the whole scene in a single image has never been easier. The L-series is Canon’s flagship professional lens range, representing the best in precision-designed EF optics. L-series lenses combine superior performance with superlative handling, and are highly resistant to dust and moisture. Dust/moisture resistance – ¹ Lenses with dust/moisture resistance are fitted with a rubber ring on the lens mount which may cause sligth abrasion of the camera mount. This in no way affects either the lens or camera performance.